Connie says, "I am legally blind and mostly pieced by feel. I saw a wall hanging and thought it would make a beautiful bed quilt, so I just kept going. Someone else will have to tell me where any problems are, because I can't see them." Our response would be that this is a daunting project even for quilters with perfect eyesight; so Connie's work, which she accomplished despite her vision challenges, is exemplary. Congratulations to her for this wonderful accomplishment ! The quilt is based on the Convex Illusions quilt pattern by Kathleen Andrews. In this close-up, you can see the interesting contrasts provided by the ombre green fabric of the inner borders and the textures provided by Wren Wookland's excellent quilting work. Winner of an Award of Excellence, Patti writes, "I had this pattern on my shelf for a year or two and was afraid of the circle, y-seams, and many, many templates. Sewing another quilt from [designer] Jen Kingwell, I was able to successfully make template blocks, which gave me the courage to begin this project. I loved the bright colors. It makes me happy to look at it !" This blue ribbon-winning quilt is based on The Circle Game pattern by Jen Kingwell. These happy, vibrant colors really pop out against the fun black and white background of the blocks. We admire Patti's ability in completing this intricate patchwork and applique. This quilt has been cut, pieced, and stitched together by the Quilt-In-Time quilters, a very small group formed in 1998 in Monticello, Utah. The theme of flying geese is emphasized not only by the attractive patchwork blocks which represent actual geese, but also by the triangle motifs known by quilters as flying geese blocks, done here in autumn colors of caramel, gold, and cinnamon. There are hundreds of flying geese blocks in this quilt! Margo notes, "The floral fabric was purchased while on a trip to Portland, Oregon. It took a few years before I added the red and yellow fabrics and designed the background. The flowers are all hand appliqued. Pele is the goddess of Kilauea volcano, which was erupting during the making of this quilt." Here's an excellent example of Broderie perse stitching, in which an entire printed motif is cut out and appliqued as a single pattern onto a background. These brilliant colors are a perfect reminder of the lush tropical foliage of the Hawaiian Islands. Mary states, "Always enjoying new quilt styles and challenges, I read about this beautiful, colorful quilt and tried it. I'm 97 years old and loved all the hand work of putting together the blocks and applique flowers." This patchwork design is the traditional "Winding Ways" pattern. We really admire Marjory's beautiful hand quilting work. She has done an excellent job in creating this lovely project ! Quilt art, sometimes referred to as “soft paintings,” has more in common with fine art than it does with traditional quilting. The Brigham City Museum (Utah) is presenting the 46th International Quilt Invitational Exhibit from June 16 through September 1, 2018. The exhibit features universally prized quilts by artists from Italy, the Netherlands, Germany, Australia, the United Kingdom, Canada and the United States. We hope you enjoy these outstanding quilts! This wonderful photorealistic quilt by featured artist, Barbara McKie, was a standout at the show. McKie and her husband visited Egypt in 2007. The background is a heiroglyphic from a temple that she saw. The quilt features seven delightful camels; their funny expressions caught her eye, and she recorded them with her camera. Many of the camels she saw had pompoms and tassels, so she embellished all the camels in the quilt with yarn. Trapunto was used to make the camels stand out and to sculpt their heads. This outstanding mosaic quilt is adapted from Michelangelo's statue of David. Gilli used photos of the statue as her inspiration and put the image through a cross-stitch program which converted it to pixels. The quilt is 76 inches tall and is made with 300 different fabrics, cut into 13,800 3/4" squares that were appliqued to a background. The piece is quilted with the story of David's rise and fall from grace. It took Gilli a year to plan the design for the quilt in her head, and to collect fabric when she visited shows and quilt shops. She even cut up some of her family's clothing. Then she had to wait three months for her husband to build a table large enough and high enough for her to start the quilt. The quilt was completed in three months. David won First Place in the Large Wallhanging Category at Quilt champion UK at Sandown in 2015. This quilt was started while Lisa Walton was teaching in the beautiful Italian village of Orvieto. All the fabrics were created from white cloth using a variety of surface design techniques such as dyeing, painting, rubbing, and foiling. The overlay motif is a copy of a semi-circular, wrought-iron frame over the door of Walton's favorite coffee shop in Orvieto. Orvieto Memories was part of Lisa's exhibition celebrating her Jewel Pearce Patterson award for quilting teachers, displayed at the International Quilt Festival in Houston in 2011. For more information on the quilt please see Lisa Walton's website. R. Leslie Forbes is currently living in Western Canada in a wine- and fruit-growing region. Her family spent summers at their cottage at "Trail's End" near the town of St. George. She and her three siblings would wander the small town savoring ice cream cones, but the area by the waterfalls and the mill was strictly off limits. On a return trip with her sister as adults, they wanted to explore the mill. Forbes took the picture that inspired this quilt, which was fabricated exclusively with Forbes' own hand-dyed and painted fabric. We are fascinated with her dimensional use of translucent and metallic fibers to re-create the shimmering waterfall, shown below. The Bobbin Buddies quilt group selected the Botanical Building in Balboa Park, San Diego, California, as their subject to celebrate the park's centennial and to coincide with the San Diego Quilt show's theme, "A Walk in the Park." To see how realistic the quilt is, compare it with this photo of the Botanical Building by Bernard Gagnon. The quilters enlarged a photo of the building to 60 inches by 40 inches, and divided it into 24 pieces. The pieces were shuffled and ranked as easy, medium, and difficult, then distributed equally to the group. Each of the eight members did not know what the final product would look like and were given pieces without knowing who got what. The pieces were then expertly matched, quilted, and bound. In the photo below you can see where 4 sections come together. After a win in the San Diego Quilt show, the Bobbin Buddies entered the piece into the American Quilters Society's competition in Paducah, Kentucky, and won First Place in Group Quilts. 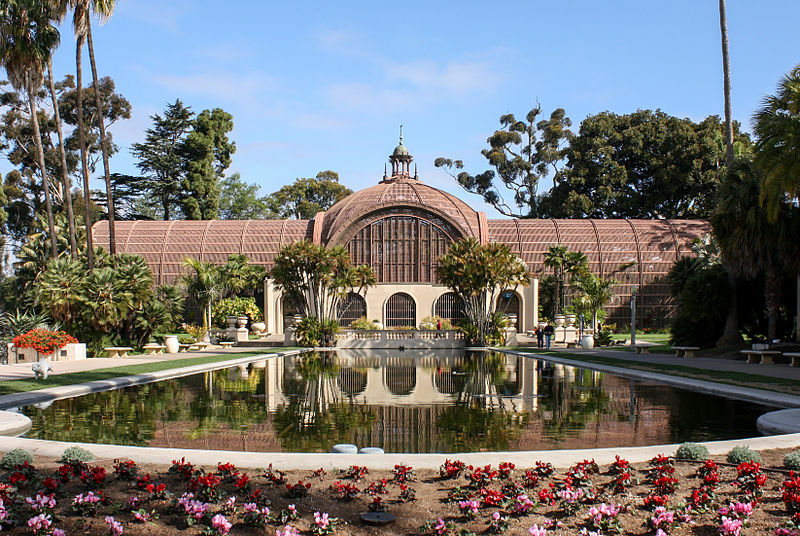 The piece was purchased by the Balboa Park Conservancy and has been on display in its Visitors Center. Quilt art, sometimes referred to as “soft paintings,” has more in common with fine art than it does with traditional quilting. The Brigham City Museum (Utah) is presenting the 46th International Quilt Invitational Exhibit from June 16 through September 1, 2018. The exhibit features universally prized quilts by artists from Europe, Australia and North America. In today's post we're featuring U.S. artists. We hope you enjoy this selection of outstanding quilts! This is one of Cuauhtemoc's quilts from his "Celebration" series. He says he wanted to express the simple joy of everyday life in it. Fiesta incorporates the applique process with cottons on a burlap backing using some traditional fabric from Central America. The woman pictured here is wearing a traditional Bolivian costume. Quilting lines that flow outward towards the edge of this piece give the viewer the impression that they are moving gently as the woman moves.Quilted with a domestic machine, these lines bring a sense of energy and motion to Cuauhtemoc's very eye-catching work. Melissa made this quilt for daughter Natalie, who traveled to Moscow to study Russian. Melissa says that Natalie was enchanted by Russian history, art, and culture; and saw a beautiful Russia through her eyes and her camera's lens. This quilt was inspired by one of Natalie's photographs. Melissa has incorporated excellent detail in her work by using stitching lines to depict the elaborate architectural details of each building. Franki comments that she has been enthralled with the fan-shaped ginkgo leaf for many years; and every time she uses this simple leaf as a design element in her art, she falls more deeply in love with it. Her quilt features a spray of ginkgos in their fall finery. Lovely thread painting here displays the slightly mysterious, ethereal quality of the ginkgo leaves, an ancient plant. Ginkgos have been found in fossils dating back 270 million years. Williams was closely associated with the modernist movement in literature. Laura's quilt was constructed with hand-dyed and printed fabrics, as well as fused applique. It is machine quilted. Her very artistic use of the dark background provides the contrast needed to display the burgeoning plants in the rich brown soil. Sandra utilized a technique known as "Material Matrix" to interpret a gridded photograph, using her eye to reproduce the image with fabrics and piecing. It is based on a photo taken in Italy, which is a fond reminder of her trip. Because it is impossible to create perfect circles with this technique, the entire quilt was made (quilted, blocked, and bound) before Sandra added the lemons and some of the leaves. These were attached by hand, using applique.She free-motion quilted it on her long-arm machine. All the materials on this intriguing and beautifully-constructed work are commercial cottons and hand-dyed fabrics. Quilt art, sometimes referred to as “soft paintings,” has more in common with fine art than it does with the traditional quilting. The Brigham City Museum (Utah) is presenting the 46th International Quilt Invitational Exhibit from June 16 through September 1, 2018. The exhibit features universally prized quilts by artists from Italy, the Netherlands, Germany, Australia, the United Kingdom, Canada and the United States. We hope you enjoy this selection of outstanding quilts! When Sonia Bardella saw her two-year-old grandson somersaulting on a patch of new, soft, green grass on a cold winter day, the quilter knew she had to capture the moment with fabric and paint. Her grandson's innocence and playfulness brought a breath of fresh, spring air to all those watching him. This quilt was created with hand-painting using pastel oil, embroidery, applique, and snippets (small pieces of cloth) and is hand- and machine-quilted. Sonia says the somersault surprised a bee who flew low over the water making concentric rings on its surface. The closeup photo shows the snippets of fabric and the embroidered bee detail. Barbara McKie is the Featured Artist at the Brigham City Museum's 46th Annual Invitational show. She specializes in digitally created nature quilts based on her own photographs and surface design. The inspiration for this quilt was from McKie's visit to the Florida Everglades, where she saw an anhinga spreading its wings against a background of water surrounded by green plants. Anhinga was created with disperse dyed polyester print, free-motion machine applique, trapunto, thread painting, machine quilting, and several layers of wool batting. Bold graphic images of vintage travel posters inspired artist Michael Fitchett's design for Heart of the Alps. The location is in Murren, Switzerland, where Michael Fitchett was looking for a scene suitable for a quilt design. Suddenly this view suddenly presented itself. The northern flank of the Eiger rose sharp in the clear air. Although winter has passed, its legacy of snow is at its thickest. Their color and style of vintage travel posters lent themselves well to working with blocks of plain color fabric. The choice of fabrics was guided by color and tonal values, with careful planning heightening the effect of sunshine and shadow. The quilt was constructed with bonded applique and machine stitching. The stimulus for this quilt is a bullet-shaped, 41-story, modern building in London, constructed with 745 huge diamond-shaped panes of glass. In medieval times, St Mary Axe was the name given to the street where the building is located. The composition includes three high-rise office blocks with one disappearing upwards. A red crane represents the construction work underway in the area at the time. Fitchett created the design by taking photographs of reflections on the glass surface of the building and turning them into drawings... working from the final drawing, she used free cut patchwork and constructed each diamond segment by machine. The diamonds were joined with 1/4" wide sashing to represent the window frames. You can read more about Greta Fitchett and Michael Fitchett at their joint website, Heatherlea Design. This scene is based on R. Leslie Forbes' photos of icebergs off the coast of Newfoundland. Her granddaughter challenged her to make a quilt with an iceberg after the two of them viewed photos of "sculptures in ice" from her school's science project. Forbes took artistic license and added mountains to the background to contrast with the shimmering white/blue of the ice floating in the North Atlantic Ocean. Some of the wonderful fabrics and embellishments can be seen in this photo. R. Leslie Forbes says her goal is to paint with fabric and thread, honoring four generations of quilters in her family. Nature's Floating Sculptures was made with commercial and hand-dyed fabric, dyed wool, and shells. It was machine assembled and machine quilted, and tsukineko ink was used for highlights. This stunning quilt really drew our eye. It was inspired by the artwork of Antoni Gaudi (Barcelona), who animated the surfaces of his work with floral or reptilian metalwork, bright ceramic tiles, and patterned brick or stone. The tile floors of two of Gaudi's buildings were structured like clusters of lily pads. A single piece of hand dyed fabric was cut and pieced to create the background of Barcelona Sunset. A tile design was quilted over the top and then hand painted with fabric paints. You can find more information about this and other works of art on Lisa Walton's website.